Need capital? Marketing assistance? Affordable crop insurance? There’s a farm bill for that. Farm bill programs help farmers grow safe and healthy food for America and the world. Franklin D. Roosevelt signed the first farm bill into law in 1933. The farm bill, formal title Agricultural Adjustment Act, was part of FDR’s New Deal. It aimed to restore the U.S. agricultural economy after the Great Depression and Dust Bowl. The 1933 bill authorized the first price supports and production adjustments for farmers. Today’s farm bill is much more comprehensive. It covers commodities, conservation, trade, nutrition, credit, rural development, research and extension, forestry, energy, horticulture, crop insurance, and miscellaneous programs. The current farm bill was signed into law by President Obama in 2014; it expires September 30, 2018. Washington D.C. is a long way from the heartland of America. Even knowledgeable representatives from states with robust agriculture may not fully understand the challenges and issues our farms face. The farm bill may be controversial, but I have yet to meet a farmer who hasn’t benefitted from at least one farm bill program. Farmers must tell lawmakers how our operations have benefitted from farm bill programs so that the 2018 bill reflects the needs of American farmers. 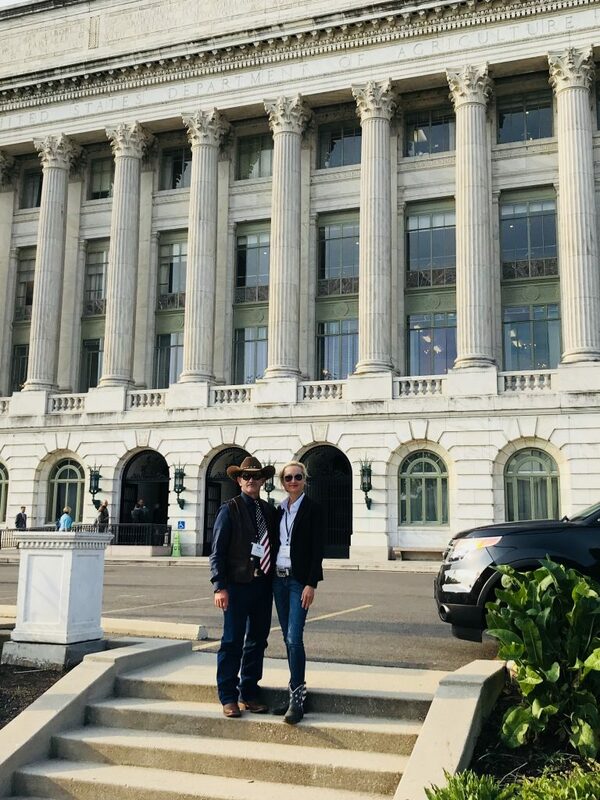 Ivory and Kipp Harlow outside the USDA in Washington D.C. last month. Credit. As a beginning farmer, purchasing farmland was a major hurdle to starting a farm. The farm bill helps farmers access credit through guaranteed and direct loan programs. The Farm Service Agency (FSA) works with lenders to make low-interest agricultural loans to farmers whom cannot access capital otherwise. FSA and Farm Credit Mid-America put together a guaranteed loan package that made it possible to purchase my first farm. Conservation. The farm bill authorizes Conservation Reserve Programs (CRP) to help farmers make environmental improvements to our farms. I utilize CRP to grow healthy grasslands, maintain filter strips, and create pollinator and wildlife habitat on my farm. Risk Management. Risk management programs protect crops and livestock from disease and natural disasters. The farm bill subsidizes the cost of crop insurance to make it more affordable for farmers. Last year, rain flooded my friend’s produce fields. Fortunately, she had a whole farm policy in place that recouped 80% of lost revenue. Whole farm policies are perfect for diversified farms because they can cover specialty crops, organics and livestock. Education and Development. The farm bill supports education and development of new and beginning farmers. Although I started my career in agriculture with a business degree under my belt, I had never written a business plan before I started farming. Beginning farmer education programs helped me write my first business plan, create a budget, and forecast financials. I attended a grazing workshop to learn how to improve forage quality and optimize my herds health. My farm benefitted from small business start-up counseling and received technical assistance during the growth stage. Farm bill funded beginning farmer education and development programs help make my farm a success.